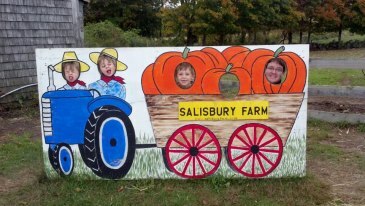 I think we had the perfect New England fall weekend. Saturday morning we hit the ground running as a family and spent the entire day outside. 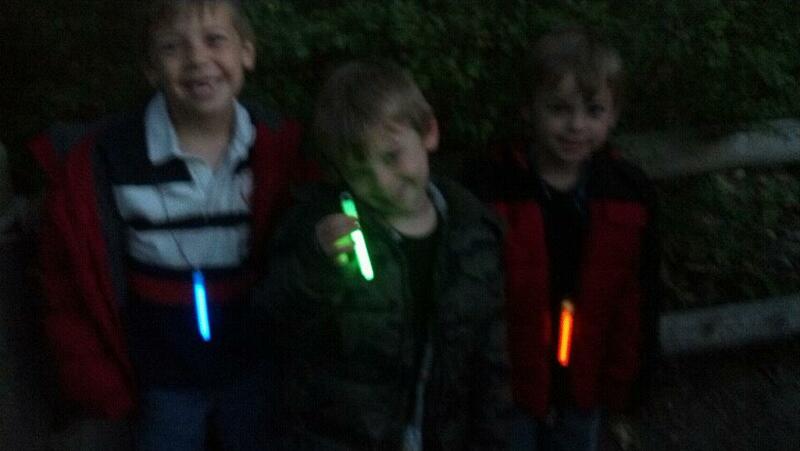 The boys were invited to a birthday party for their Kindergarten friend. Al took the Big Guy to soccer. Then we were all off to Confreda Farms for the boys first corn maze. I had won tickets and entertainment passes from a giveaway on my friend Liza's blog (I know, so strange to have a friend Liza! Ha ha!) and we saved them a few weeks so it would really feel like fall. It was freezing outside so it felt like the perfect day too! 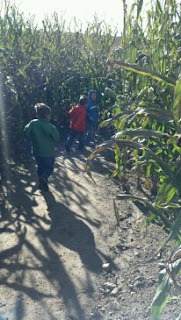 The Doodle Bop was so scared to get in the maze, but within seconds he was running ahead and laughing with his brothers. 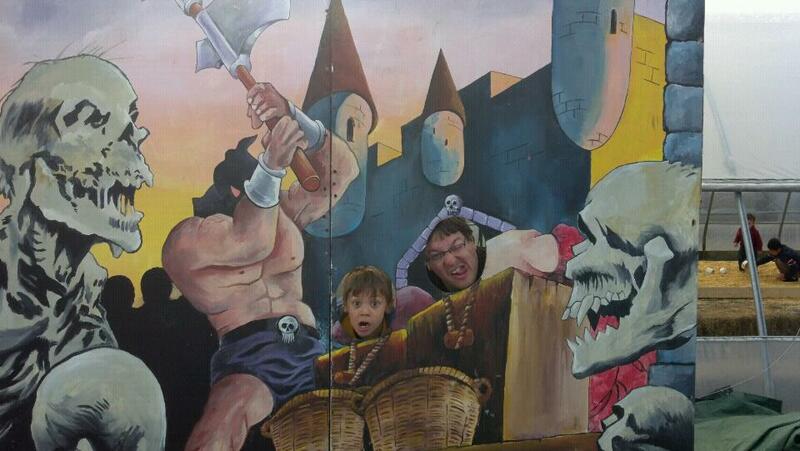 As is our history, we narrowly avoided another pumpkin patch incident and had to make a run through the second half of the maze so two kids could use the porta potties right outside it. I swear it doesn't matter how many times you have your kids use the bathroom, they only have to go when there isn't a place. 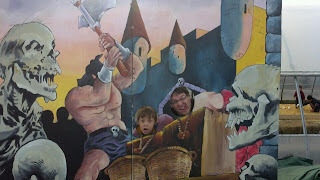 The Big Guy and I took this photo while the twins...did their thing shall we say. After the patch they got to do some of the entertainment things. Hay jumping, bounce house, giant inflatable slide and a small flying animal ride. Loved this part below! 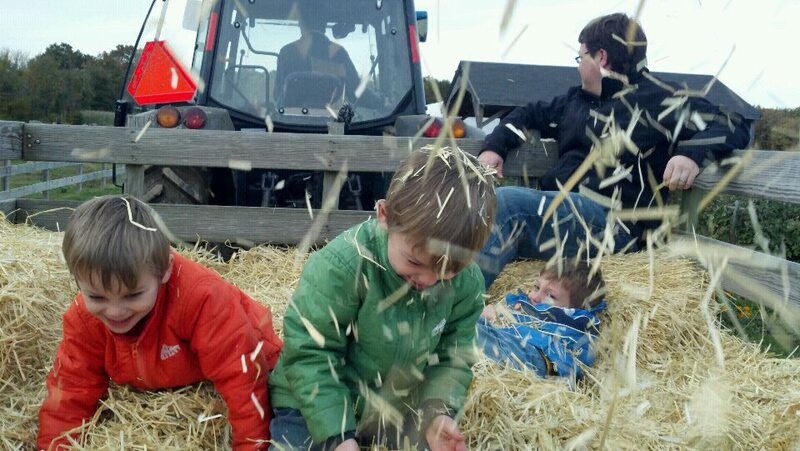 Instead of getting pumpkins at Confreda, we decided to head back to our regular spot - Salisbury Farm - and hopped on the hayride with the boys. It was the end of the day and after a few people got on and then off before we left, we were asked if we wanted our own private hayride. The boys thought that was awesome. And then they covered me with hay. 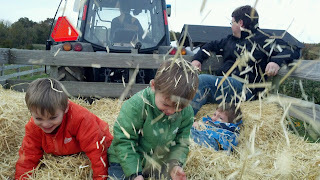 Did I mention the guy driving the tractor kept turning around and laughing? Too funny! This year Al and I finally got smart and told the boys they could only get a pumpkin that they could carry on their own. 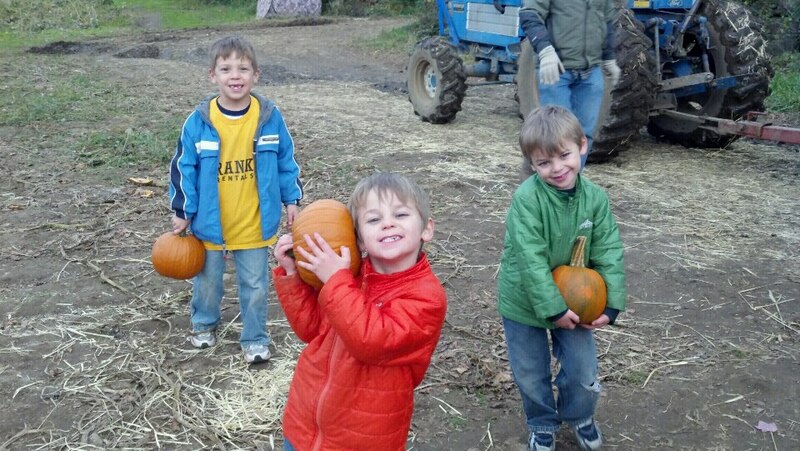 Mommy and Daddy would not be lugging giant pumpkins for anyone this year. These are the perfect ones they picked out. 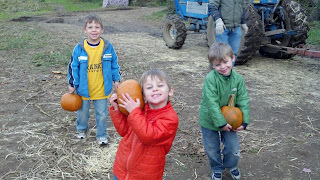 We picked up a little pumpkin for Giulianna and took this photo before we left for home. As I snapped that photo everyone was all smiles, it was in the last split second the twins decided to clown it up. Because of course. Today we started our morning with a trip to Ana's house so the boys could meet their baby cousin for the first time. Their excitement was one of the most adorable things I have ever seen. Love at first sight with those guys. G's going to have some big protectors when she gets older. 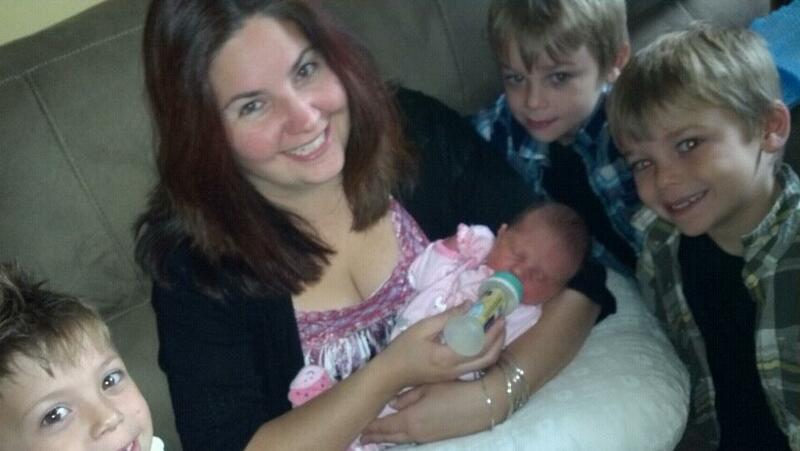 They were dressed up especially for their very first photo with her. Melted my heart. Later we were at Al's parents house for lunch, and then I spent some time with my family at my sister's baby shower for the afternoon. 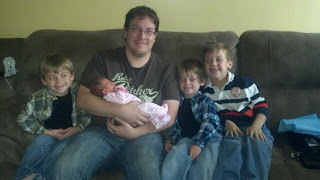 A few more weeks and the boys will have another new baby cousin. 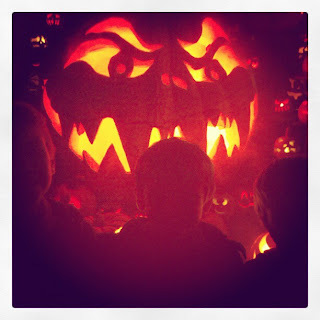 To cap off our crazy weekend, we met up with some of Al's friends and coworkers and took all of our kids to the Jack-O-Lantern Spectacular at Roger Williams Park Zoo. 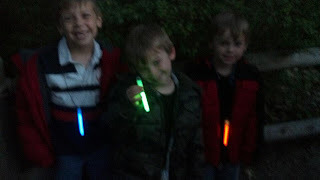 Sarah passed out glow stick necklaces for the kids as they waited in line and they were all smiles. We capped off the night with some hot chocolate all around from Dunkin Donuts and the boys were finally in bed, even if it was way past their bedtime. What a great weekend we had! I honestly can't remember the last time we packed so much fall fun into just two days. In related news, I think I might be hitting the hay a little early myself tonight! Sounds like an awesome weekend, so glad u had fun with the tickets!! Sounds fun! 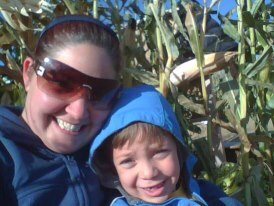 W did some pumpkin picking too....I should eventually post about it. 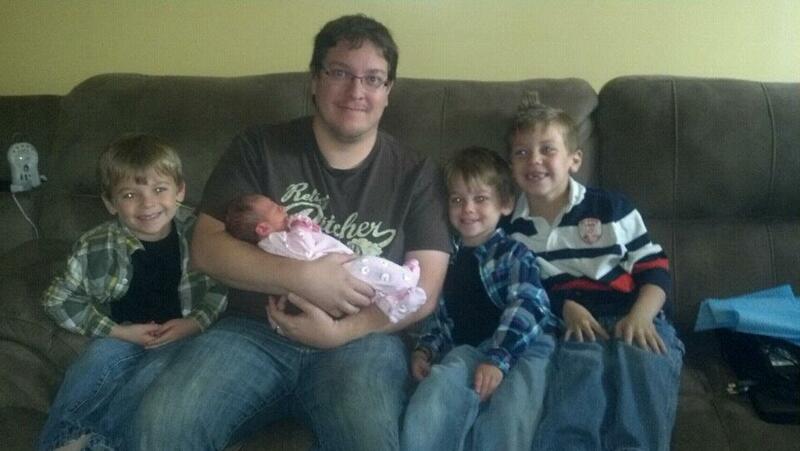 lol I think it is so cute that the boys got dressed up to take a picture with the baby! So sweet!